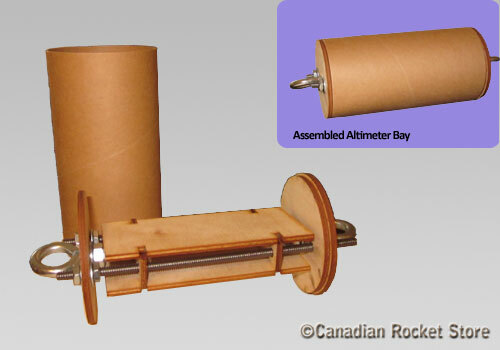 This Removable Altimeter Bay Coupler fits inside Standard 4" Airframe. This kit for housing deployment and tracking electronics includes the tubes, 1/4" plywood bulkheads, a plywood mounting sled, nuts, washers, lock washers, eyelets, airframe wwitch band plastic rivets, and threaded rods. This removable Bay includes 1" piece of airframe and plastic rivets, which allows it to be removed from the airframe. Below is one of possible configurations where this bay can be employed. Simply enter your details below and we will send you an e-mail when “4" Removable Altimeter Bay” is back in stock!